It's been an exciting week for Ghostbusters fans with the announcement of Jason Reitman's Ghostbusters 3. Now, original cast members Dan Aykroyd and Ernie Hudson are talking about the project on social media, with Aykroyd going as far as to offer his services. Reitman released a teaser for the upcoming movie earlier today, which played heavily off of nostalgia for the original two movies and characters, featuring the iconic Ecto-1. 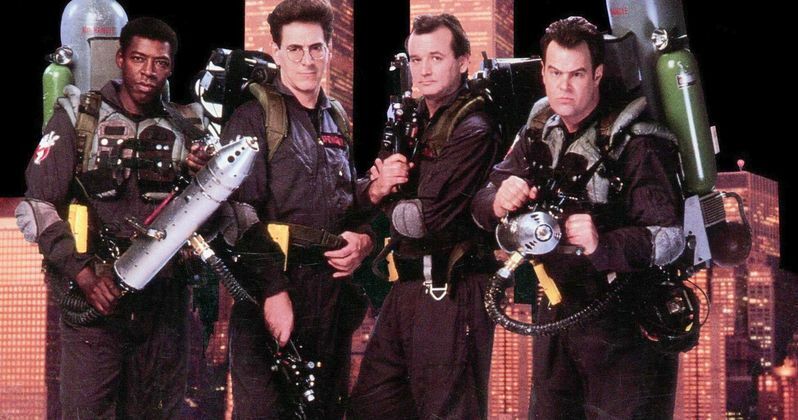 It's too early to know who will be cast in Ghostbusters 3, but fans are holding out hope that Aykroyd, Hudson, and Bill Murray will at least make a cameo together. Dan Aykroyd has been very vocal about the Ghostbusters franchise over the years, teasing different projects that have either not yet happened, or are still in the development phase. It's hard to believe that he isn't involved in Ghostbusters 3 in some capacity, and his tweet this morning in reaction to the short Ghostbusters 3 teaser seemed to be teasing something of his own. In reference to the ol' Ecto-1 looking a little beat up, the actor said, "If you need a tune-up, you know who to call." After Dan Aykroyd posted his tweet, original Ghostbusters co-star Ernie Hudson responded by saying, "Bigger than a 100-ft marshmallow man!" At the very least, this could be a sign that the original cast members are endorsing Ghostbusters 3, which is pretty cool on its own. Jason Reitman has revealed that he isn't making a reboot of the franchise. Instead, the director/writer says that it will be a continuation from the original sequel and fans are starting to get pretty excited about what that could mean. "There is a possibility of a reunion with the three remaining Ghostbusters. It's being written right now... I think Billy will come. The story's so good. Even if he plays a ghost." Bill Murray is, and always has been, the wildcard. The actor has never really been interested in Ghostbusters 3, but he seems to have warmed up to the idea over the past few years. Murray and Harold Ramis feuded for years, but later made peace before Ramis passed away. That being said, it's going to be interesting to see how this all pans out. It certainly seems like it's heading in the right direction, even at this very early stage of development. At the very least, Dan Aykroyd and Ernie Hudson are excited to see what Jason Reitman does with Ghostbusters 3. You can check out the social media posts below, starting with Dan Aykroyd's Twitter account. Bigger than a 100-ft marshmallow man! https://t.co/KG7l9Rv4HQ "@dan_aykroyd: If you need a tune-up, u know who 2 call #GB20https://t.co/pvs1l5Nze9"